On Monday 25 May 2015 three Cunard liners – Queen Elizabeth, Queen Mary 2 and Queen Victoria – reunited in Liverpool to celebrate the line’s 175th anniversary at its spiritual home. 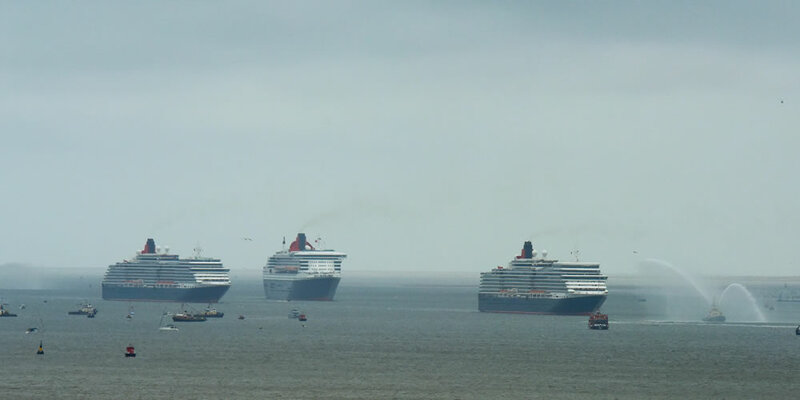 Queen Mary 2 had arrived on the Sunday and joined her sisters on Bank Holiday Monday at the mouth of the River Mersey. Up to one million spectators watched as the three liners then sailed up the River Mersey and perform a manoeuvre in unison as part of the 175th anniversary celebrations. The three ships sailed in single file along the river to the city’s Three Graces – the Royal Liver Building, The Port of Liverpool Building, and the Cunard Building. Here, just 400 metres apart, they turned 180-degrees before sailing in an arrowhead formation narrowing to just just 130 metres apart. For those who missed this remarkable event the live broadcast was recorded by Cunard and can be viewed online below. As an alternative to this one and a half hour video, a bite-sized time-lapse version of the event has also been uploaded by Cunard. This captures the moment the three Queens performed manoeuvres in unison in Liverpool. This video also clearly reveals the strength of the current of the River Mersey during the event making the manoeuvres seem even more impressive. The RAF Red Arrows took part in these historic celebrations and flew over the three Queens as they saluted the city of Liverpool, leaving a trail of red, white and blue. Following the celebrations Queen Mary 2 sailed out of the city while Queen Elizabeth berthed at the Cruise Liner Terminal. Spectators on land and guests aboard Queen Elizabeth enjoyed a spectacular fireworks display as a fitting send-off as she too sailed out of the city that night, leaving Queen Victoria berthed at the Cruise Liner Terminal until the following evening. Earlier in May the three Queens had reunited in Southampton where the three captains took the opportunity to stand together on the funnel of Queen Mary 2 for an incredible and iconic photograph.